Passed away peacefully on 28 March with her family present. Loving mother of Elizabeth, Ian, Jane and Michael. Mother in law to Jon and Jack. Grandmother to Alastair, Jemma, Joss, Annabel, Lucy, Angus, Claudia and Robbie. Loving memories of a beautiful unique woman. 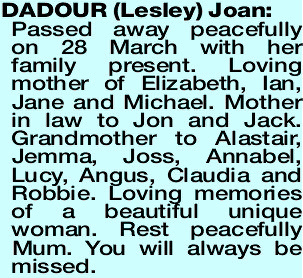 Rest peacefully Mum. You will always be missed. The Funeral Service for the late Mrs Joan Dadour of Nedlands will assemble at the main entrance of Karrakatta Cemetery, Railway Road, KARRAKATTA on TUESDAY (9.4.2019) at 10.30am for a Cremation Service. Dear Joan, you will be sadly missed. Deepest sympathy to the family. Highly valued, loyal and caring friend of Joan Muhling. Her infectious laughter will be sadly missed. Deepest sympathy to Elizabeth, Ian, Jane, Michael and families.